Moreover, formulating rules and standards are driving structural growth in the uptake of LNG as a shipping fuel. These regulations are implemented through the IMO’s International Convention for the Prevention of Pollution from ships. Certain regions have likewise assigned stricter emission rules. Other than air quality measure, the IMO is additionally introducing devices to monitor, screen, and substantially reduce GHG (Greenhouse Gas) emissions from ships. 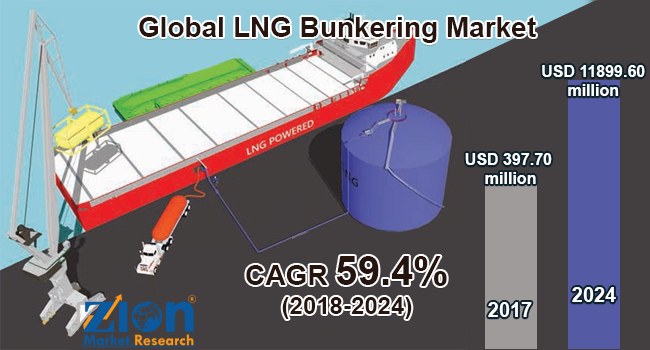 Such factors are expected to drive the LNG bunkering market growth over the forecast period. Europe held substantial revenue share of the global LNG bunkering market in 2017 and the region is anticipated to continue with its regional supremacy over the forecast time period. The growth of this regional market is attributed because Norway is considered to be the biggest bunking center, as it offers more than 18 000 LNG bunk stations. Additionally, rising uncertainties for limiting the natural effect and expanding ventures towards reconstructing and updating LNG foundation is foreseen to additionally support the development of LNG bunkering market in Europe. In 2017, the European Union (EU) states affirmed the European Commission’s proposition of contributing US$24.18 million to create productive and supportable transportation for LNG bunkering.